Located on the Qinghai-Tibet Plateau at the southwest frontier of China, Tibet was considered as the roof of the world. Obviously, Tibet is a well-known tourist destination in China with its abundant historical sites and natural resources. Travelling to Tibet, you have an opportunity to visit Tibet's iconic landmarks: 1300-year-old Lhasa and the Potala Palace. Going for an adventure with a bike on the Sino-Nepal highway, paying a visit to Mt.Everest base camp exploring contemporary Tibetan life may give you an awesome experience. Besides, putting yourself into the Buddhist culture and making a holy kora around Mount Kailash, you may fall in love with this mysterious land. GTT is a reputed local travel agency in Tibet since 2005. 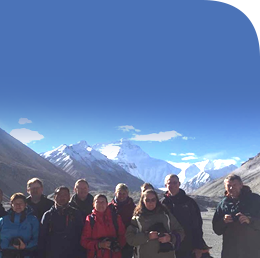 As one of the best travel agencies in Tibet, GTT has a professional and organized team to design a wonderful Tibet tour for foreigner tourists including the group tour and private tour. Meanwhile, we do handles the application of Tibet Travel Permits. Moreover, we promise to provide you safe and comfortable traveling experience in Tibet. As a newly developing Industry in Tibet, tourism of Tibet gradually make a difference in the development of the economy, society and culture. Recent years, Tibet Tourism has become the pillar industry in Tibet and the total tourism revenue is at 22.62 billion Yuan, with an average annual growth of 29.8% which made a great contribution to the national tourism industry. Tibet Tourism comes to a climax in recent years with the large quantities of tourist at home and abroad flooding into this beautiful land. The number of tourists that visit Tibet was reached 21.25 million, with an average annual growth of 30.6% since 2006.